Based on the electric remote meter reading system, the electronic seal is composed of a signal input line, a CMOS integrated circuit board, and a signal output line connected to the electric energy meter. At least one pair of signal input lines A and B are drawn from the power meter circuit board, followed by a CMOS integrated circuit board. The CMOS integrated circuit board uses a NAND gate circuit which contains at least two signal connection lines and a signal output line. The signal connection line of the product is connected with the signal input line through the signal line connector. The signal output line is connected to the memory chip in the acquisition system. Due to implementation of the above technical solutions, real-time online monitoring of seals can be carried out. When the seals are destroyed, they can be discovered in time and protective measures can be taken to minimize the losses. Unmanned electronic seals, including electronic tags and lock cords, are characterized in that the product's electronic tag is set inside the shell. 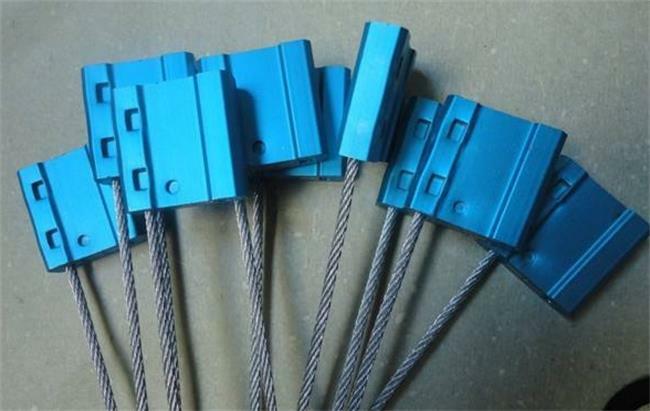 The electronic tag of the product includes the chip and the UHF coil wound on the product's chip, one end of the product’s lock rope is embedded in the metal lock body, and the other end of the lock rope is the free end relative to the lock body when not in use; Inside the perforation of the product, there are steel beads, springs and plunger from inside to outside, and the plunger of product is plugged into the external port of the product. Compared with the existing technology, the electronic seal can automatically transmit high-frequency information from the chip to the scanning device at a place 10 meters away. After the scanner detects the data, it automatically scans the file, eliminating the need for the worker to carry the scanner to the container before scanning it. It has reduced the workload and improved work efficiency. For electronic seals on the heights, It avoids the workers to climb high scans, ensuring the safety of the work. Electronic seals also have certain drawbacks, such as large investment, it is difficult for ordinary people to maintain. Make the right choice when choosing a seal.